"I'm not a fan of dry taco salad but couldn't ever find a dressing I was a fan of. So I threw together a few things, and voila! A delicious dressing that is worthy of taco salad." Mix sour cream, ranch dressing, picante sauce, and chili powder in a bowl until thoroughly combined. yummy! I used leftovers for dipping chips in later. 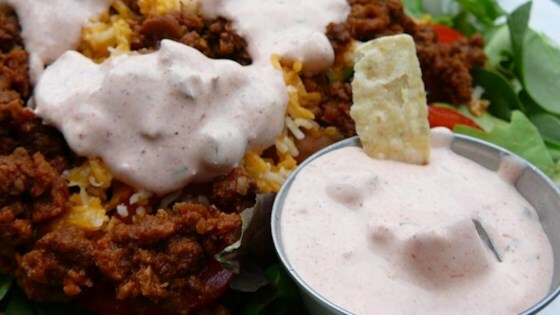 This is a great dressing for taco salad. Additionally I did add 1/4 tsp of homemade taco seasoning. Love it!!! Added 1/4 cup of Catalina salad dressing and it was great.